No need to smother butter and salt on this corn on the cob. 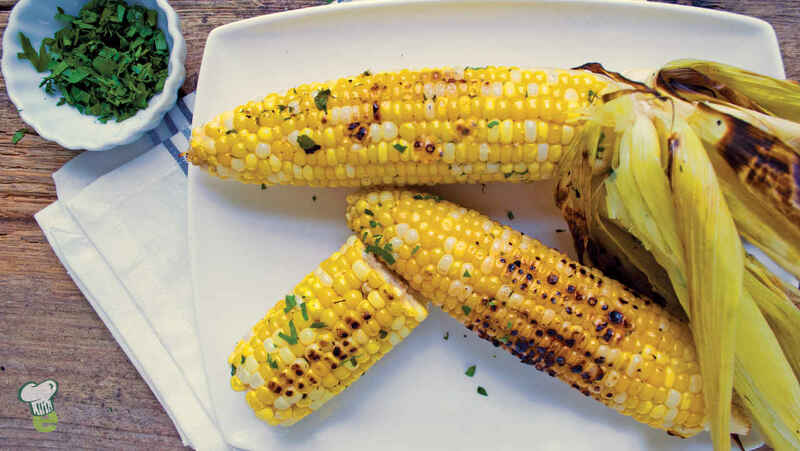 Healthy olive oil and fragrant herbs and spices will make this easy corn on the cob a favorite summer side dish. In a large pot of cold water, soak the whole cobs for 15 minutes (the ears should be completely covered with water). Lightly spray a grill rack with nonstick cooking spray. Preheat grill to medium heat. In a small bowl, combine olive oil, garlic, onion, nutmeg, pepper and parsley. Remove corn from water and shake off any excess water. Pull husks back, but do not completely remove them. Remove and discard only the silk. Spread the olive oil mixture over the kernels. Rewrap the corn in the husks. Grill the corn, turning frequently, about 20 to 30 minutes, or until corn is tender. Remove corn from grill and let stand until cool enough to handle but still warm, about 10 minutes. Discard husks and stem ends from corn.